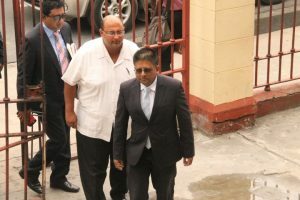 Former Finance Minister, Dr. Ashni Singh and former Chief Executive Officer of the National Industrial and Commercial Investments Limited (NICIL, Winston Brassington were Tuesday granted GY$6 million bail each on three joint charges of misconduct in public office. They were arraigned before Chief Magistrate, Ann Mc Lennan who granted them GY$2 million bail on each of the three joint charges. She declined a request by Defence Lawyer, Anil Nandlall for the bail to be reduced to GY$1 million for all three charges per person, but instead allowed the bail to be surety. Nandlall later told reporters that his defendants had to resort to mobilising cash to post the bail by a Manager’s Cheque because Singh and Brassington would have been sent to the Georgetown Prison pending the valuation of a property and the submission of transport as a surety. The charges were laid indictably. Singh and Brassington are due to return to court on June 5, 2018 by which time Special Prosecutor, Trenton Lake said he would apply for the case to be trialed summarily. Indictable charges would require a preliminary inquiry to determine if they should face trial by a High Court judge and jury. The maximum penalty for the offence if found guilty is one year’s imprisonment. Outside the courtroom, Nandlall told reporters that he would ask the Magistrate to suspend hearing that case for the three charges until the High Court hands down a decision on a case he has filed challenging the legality of the said charges. In objecting to the granting of self-bail (own recognisance) and instead for “substantial” cash bail, Prosecutor Lake told the court that the accused persons have the means and are “the subject of ongoing investigations” by the Special Organised Crime Unit of the Guyana Police Force. “There are many investigations pending for which charges may be imminent,” Lake said. Responding, Nandlall said “means” was not the proper yardstick by which to determine whether bail should be granted but whether the accused persons would not appear to stand trial. “There is nothing that the prosecution has indicated that can lead Your Worship to even draw the inference that they will not turn up,” Nandlall told the magistrate, adding that considerations should be their track record, antecedents, status and prevalence of the offence. Singh- in his capacity as then Finance Minister and NICIL Chairman- and Brassington on May 14, 2011 by way of an agreement of sale and purchase “acted recklessly when they sold Multicinema Guyana Inc. a 10 acre tract of State land at Turkeyen for GY$185,037,000 without first having procured a valuation from a competent valuation officer. 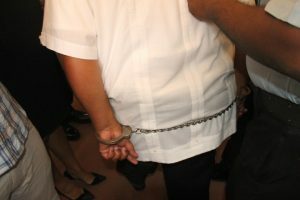 HANDCUFFED: Former Chief Executive Officer of the National Industrial and Commercial Investments Limited, Winston Brassington as he and former Finance Minister Dr. Ashni Singh, who was also handcuffed, being led to the prisoners’ holding area at the Georgetown Magistrates’ Court pending the posting of a total of GY$6 million bail. Similarly, they are accused of selling 103 acres of state land, by an agreement of sale and purchase, to National Hardware Guyana Limited for GY$598,659,398 (VAT exclusive) with first procuring a valuation. The third and similar charge also has to do with the sale of 4.7 acres of land for GY$150 million to Scady Business Corporation, “knowing that the said property was valued at GY$340 million by Rodrigues Architects Associate, a competent valuation officer. When the former Finance Minister and the former NICIL boss entered the courtroom, packed with top opposition People’s Progressive Party (PPP) members, they greeted each other warmly with firm handshakes and warm embraces. Former President, Donald Ramotar and former Prime Minister Samuel Hinds were among those present inside and outside the courtroom. Former President Bharrat Jagdeo was not there. Moments after Singh and Brassington were placed in the prisoners dock, the case was called at 1:15 PM. The charges were read to the accused who stood expressionless and clearly left everything to their battery of defence lawyers- Nandlall, Ronald Burch-Smith, Mark Waldron, Sase Gunraj, Priya Manickchand, Marcia Nadir-Sharma and Euclin Gomes. Shortly after the magistrate decided on bail, Gomes left the courtroom at 1:54 PM. A quite slim 45-year old Singh was clad in a dark blue suit and Brassington in a cream shirt-jack and dark pants. Defence Lawyer Nandlall asked the Court for the Administration of Justice Act (AJA) to be invoked to allow for the charges to be read summarily instead of indictably, but Lake objected on the grounds that he was not ready to disclose the files on these charges until possibly other matters are addressed. “We are still engaging in some additional investigations and we know once the AJA is applied, then it is for us to disclose the statements in our possession and I respectfully submit that it will be premature to apply the AJA,” he said. Nandlall repeatedly told the court that no effort was made to serve Singh and Brassington with the summons, although they reside at Cowan Street, Kingston, Georgetown and Goedverwagting, East Coast Demerara. Nandlall said it was only on Monday that Singh’s summons was served on his wife who is employed at the Auditor General’s Office and their children attend school in Guyana. Nandlall later told reporters that his clients work overseas. He said although the summons were never served on the accused men personally they voluntarily appeared in court and there was no reason why they would not attend court whenever the case is called. “He (Singh) will plead not guilty and he is most anxious to assert and vindicate his innocence,” said Nandlall who noted that the charges are he first of their kind in Guyana. Nandlall, who is senior PPP member, asked the court for an opportunity to highlight that he believed the charges were politically motivated. “These charges are an expression of political victimization against my clients and it is unfortunate that the administration of justice has to be contaminated in the manner that it has, but that is the reality,” he said. Among the PPP members and supporters, who crammed the courtroom, included Manzoor Nadir, Kwame Mc Coy, Neend ‘Neil’ Kumar, Brian Young, Robeson Benn, Harrynarine Nawbatt, Juan Edghill, Mitradevi Ally, and Zulfikar Mustapha.